For my thousandth post, I’m celebrating Nigerian Small Chops. Finger chops. Finger foods. Bite-sized food, eaten conveniently with fingers in a bite, one bite – at most, a few bites. Popular at events for the variety they offer and truly some of my favourite things ever. And I can’t believe I’ve written a thousand blog posts. And you’ve read them. Thank you for being part of this journey and self exploration. It is everything to me. Everything. So, on to small chops. And the beauty of it.Them. Because it is singular in its bucket name and plural in its offerings. There’s something for everyone and these days, I dare say people go to parties for the small chops as much as they do for the Jollof. And flavaaaaaaaaaa. That’s the ‘ish. Tick Tick Tick. 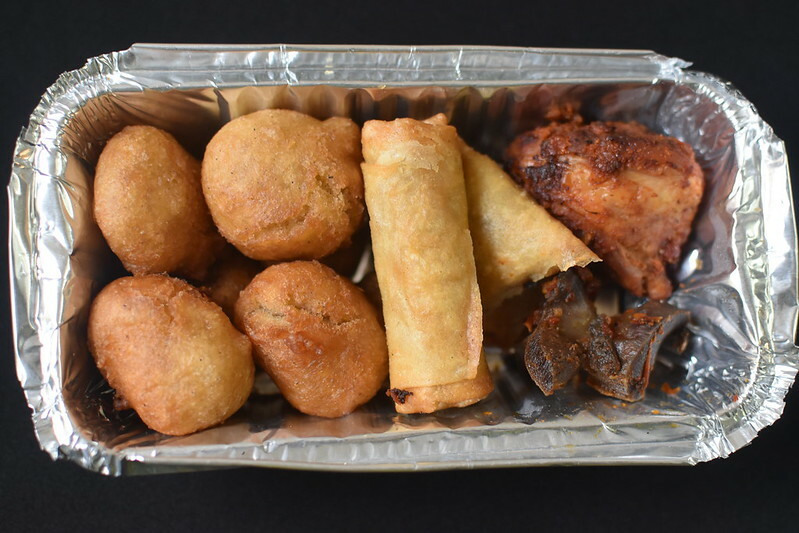 Small chops in Nigeria are all the rage – tiny, tasty bites of jazzed-up traditional recipes, served at parties of every sort. Think of them as the ‘tropical’ version of Hors D’Oeuvres. 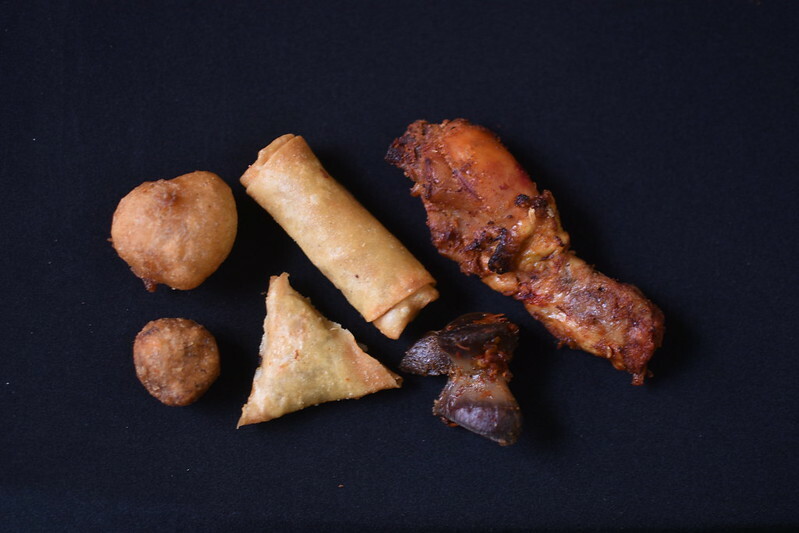 They typically contain 5 – best case – 6 items that as standard now include Puff Puff – fried dough, Mosa – mashed plantain fritters, Chinese-style spring rolls, Indian samosas, peppered snails and many more. The components of each pack contain different amounts of each item but puffpuff is usually the most plentiful thing in the pack. In Nigeria, we apparently aren’t fussed about odd or even numbers like they are in China where there are a few lucky numbers. Like 8 which is the luckiest number ever in Chinese culture. Apparently, it’s pronunciation is Ba which sounds similar to Fa, the word for ‘making a fortune’ so that people want to live on the 8th floor and perhaps if they were Nigerian, have 8 small chops per box! So what’s in a box? Puff Puff is/are usually the most ably represented in any pack. 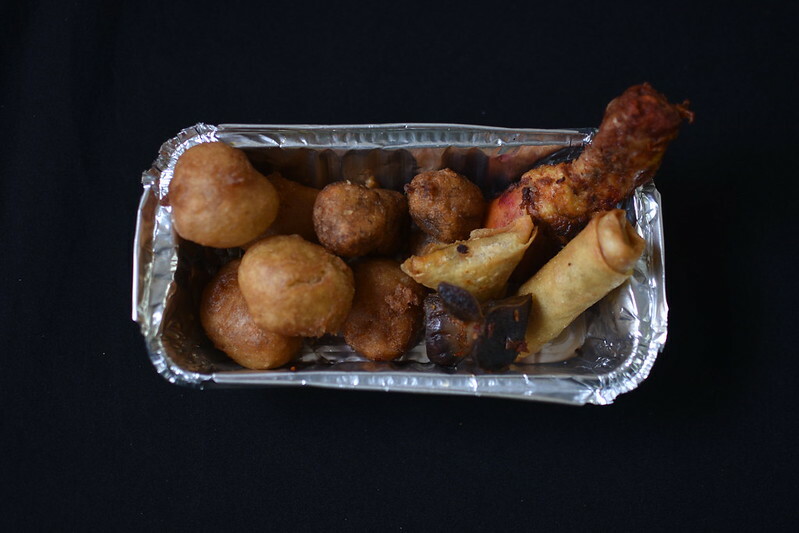 Most feature 3 – 6 balls of puff puff. Generosity or economics? Economics I dare say – flour is relatively cheap, yeast brings volume to the mix and only sugar and nutmeg are required. And thus, for a small investment, one reaps a bountiful harvest of fried dough. 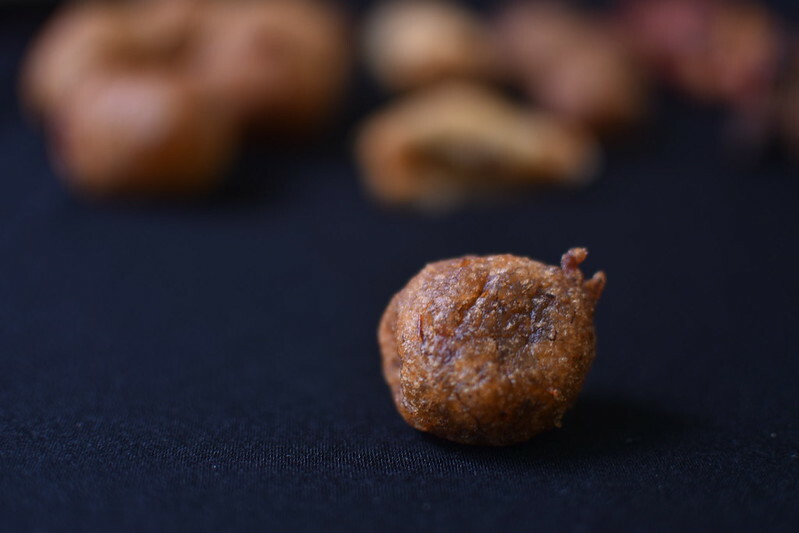 I love to pair my puff puff with the meat otherwise the monotony of it rears it’s ugly, chewy head. 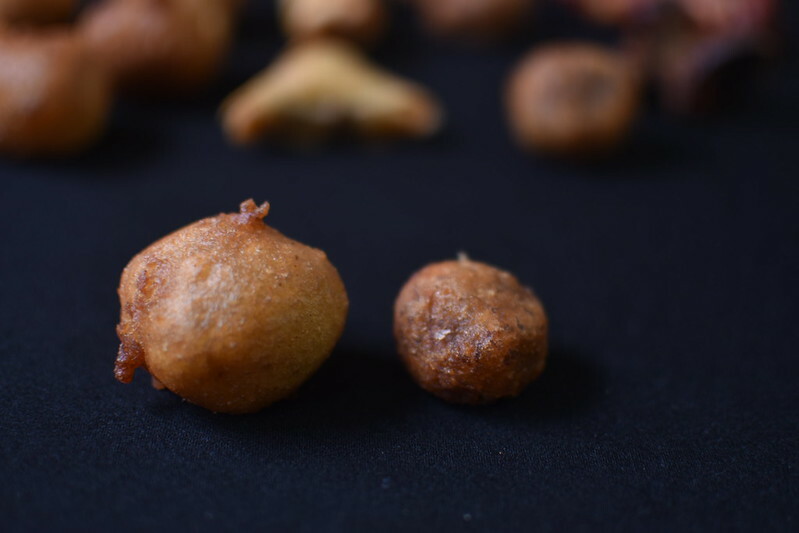 Not to mention the fact that at this time, the puff puff is not steaming-fresh-from-the-fire/oil-hot. 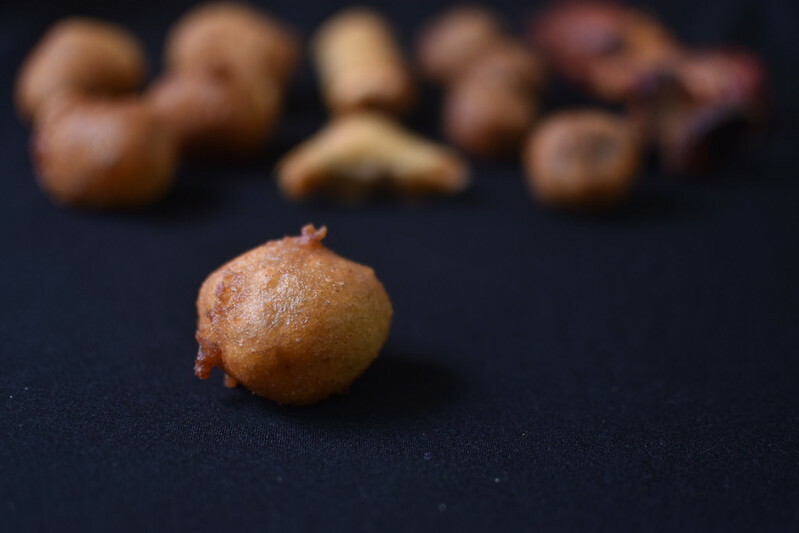 To me, the most revolting thing in any pack of small chops is Mosa. I find myself increasingly irritated because I can’t tell if the base is plantains or bananas. I think it varies and a maker of small chops told me mosa was made with bananas, of a specific kind known in Lagos and part as Yoruba bananas. Yoruba representing all the southwestern states and places. Mosa always looks wrinkled, as though forced to show up at the ball. Dough, heavy, nothing chewy and stretchy to recommend it for praise. And it isn’t as though the taste is 100. I’m a firm believer in the ‘stay home if you don’t want to turn up good and proper’. Mschew. And if you like mosa – you can stop reading now. I actually think Plantain puff puff would be a much nicer. Simply add some yeast to the mosa dough and let it flourish. But people will not hear. I’ve never seen a regular small chop pack with more than 1 samosa in my entire life. The best ones feature crisp dough and delicious mince. 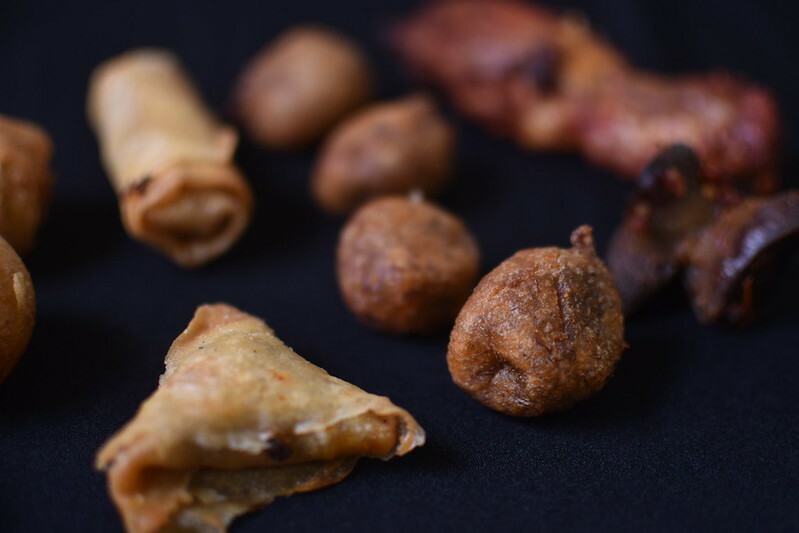 Samosas are the absolute treasure of my small chops packs. I’ll usually sneak a bite of one corner of the triangular, tetrahedral parcel to check its deliciousness and then save the rest for last. Am I the only one with this peculiar habit? Although we associate samosas with India, literature shows that the roots are Persian, from sanbosag. Theer are claims to Middle Eastern origins with mentions of it by an Iranian historian, Abolfazl Beyhaqi. 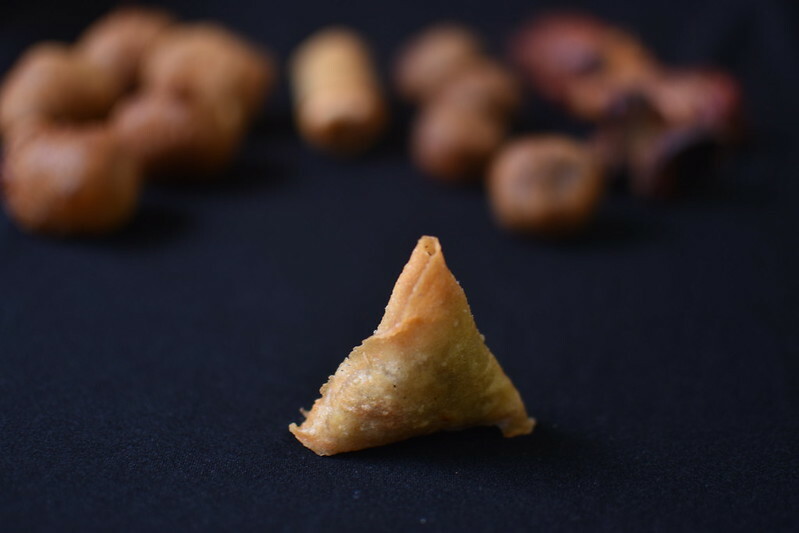 In the 13th Samosas were introduced to the Indian subcontinent in the 13th or 14th century by traders from Central Asia. 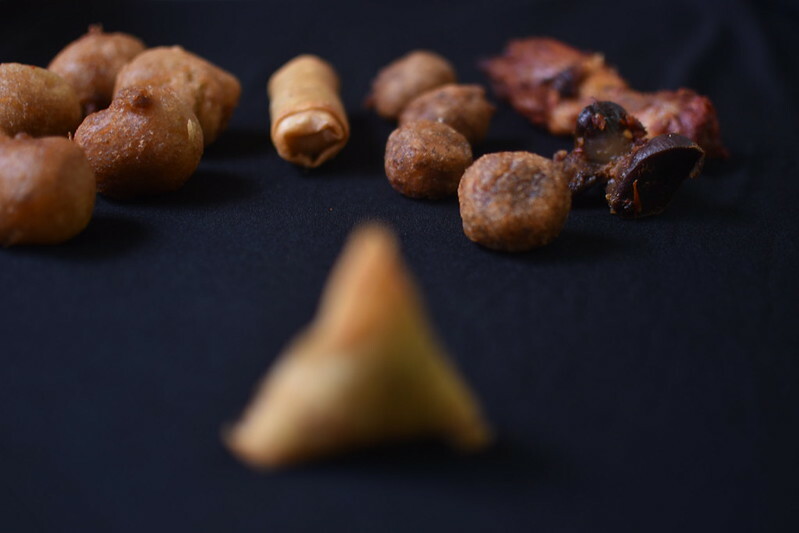 Amir Khusro(1253–1325), a scholar and the royal poet of the Delhi Sultanate, wrote in around c. 1300 CE that the princes and nobles enjoyed the “samosa prepared from meat, ghee, onion and so on”. 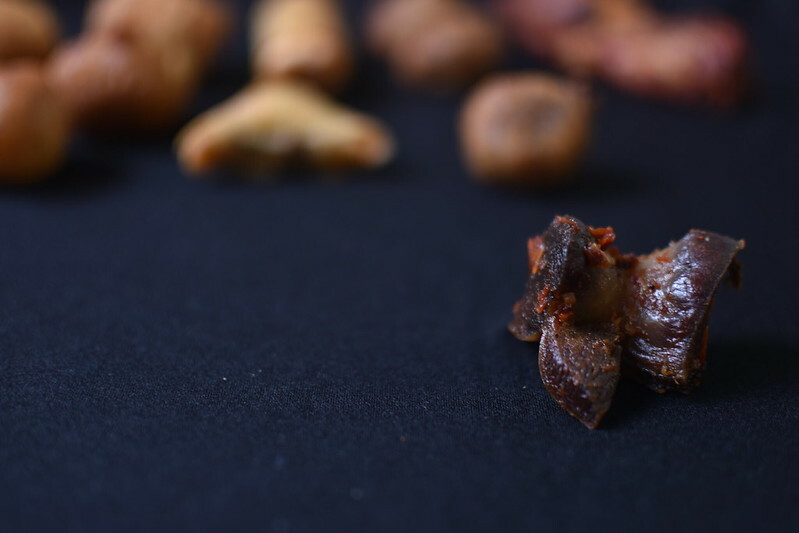 Ibn Battuta, a 14th-century traveler and explorer, describes a meal at the court of Muhammad bin Tughluq, where the samushakor sambusak, a small pie stuffed with minced meat, almonds, pistachios, walnuts and spices, was served before the third course, of pulao.The Ain-i-Akbari, a 16th-century Mughal document, mentions the recipe for qutab, which it says, “the people of Hindustan call sanbúsah”. And a story about the internationalisation of Chinese cuisine. 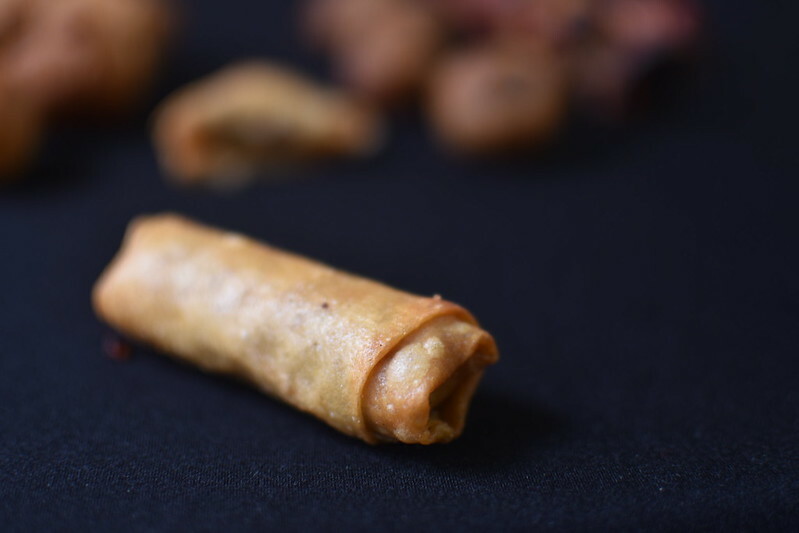 Spring rolls fall into the same class as samosas, one per pack and requiring some time investment to make the wrapper. 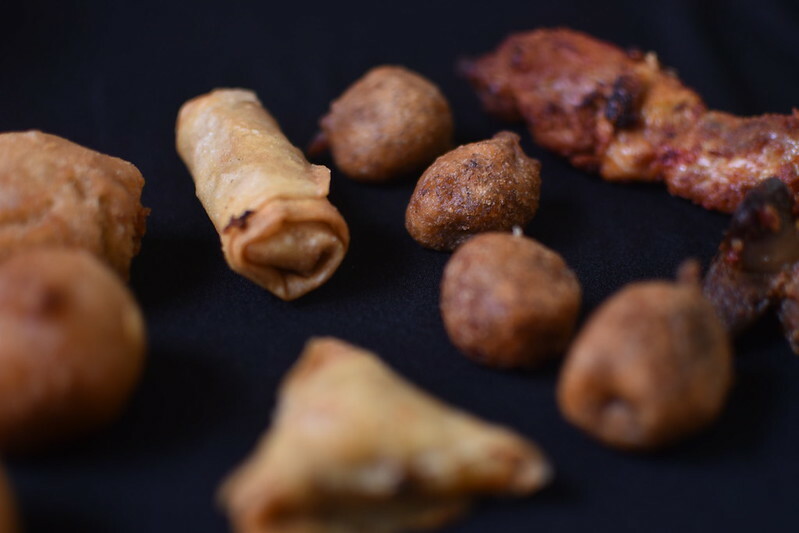 I’ve also never ever seen a regular small chops pack with more than 1 spring roll. 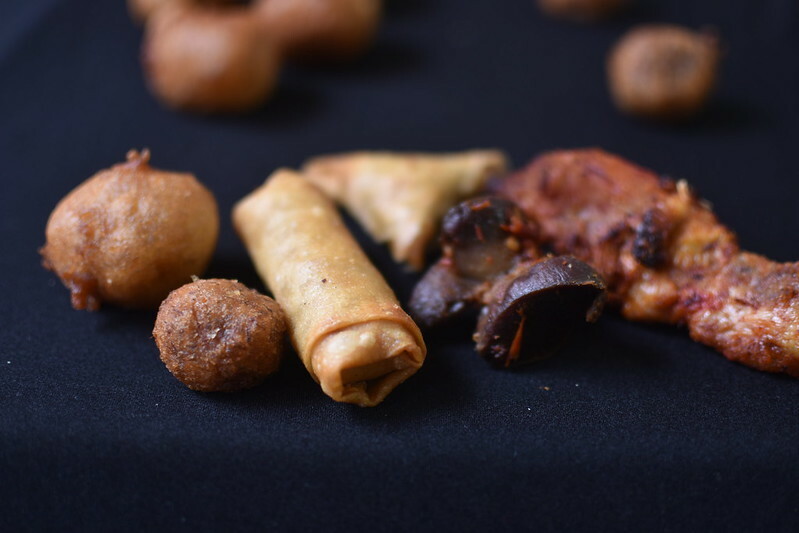 Of Chinese origin, these cigar rolls generally consist of the most minute amounts of meat – beef or chicken bulked up with vegetables – cabbage, carrots, onions being the most popular. My favourite ever spring roll features fresh ginger and cabbage. Grilled chicken, turkey, gizzards, snails feature. Often only one of these has been ‘nominated’ to attend the party. Whichever one it is, I take it as an accompaniment to our lady Puff Puff. It is never enjoyed by me for it”s inherent meaty qualities and thus on its own. No! Never! And yeah, usually, it’s representative numbers one. Singular. For the obvious expense. 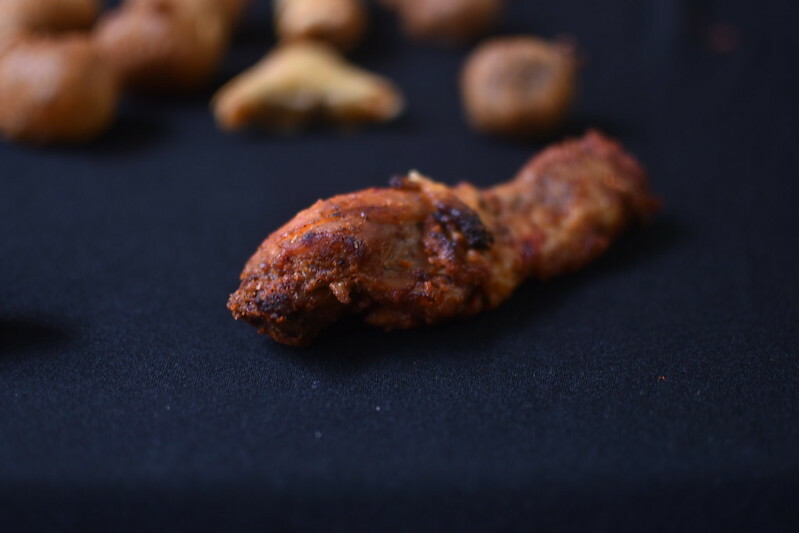 There are other items that might find their way into the pack of small chops, like stick meat. Where toothpick or mini skewer meets fried, often peppered meat. Yum too. And in executive packs one might find battered prawns, fish and other things. 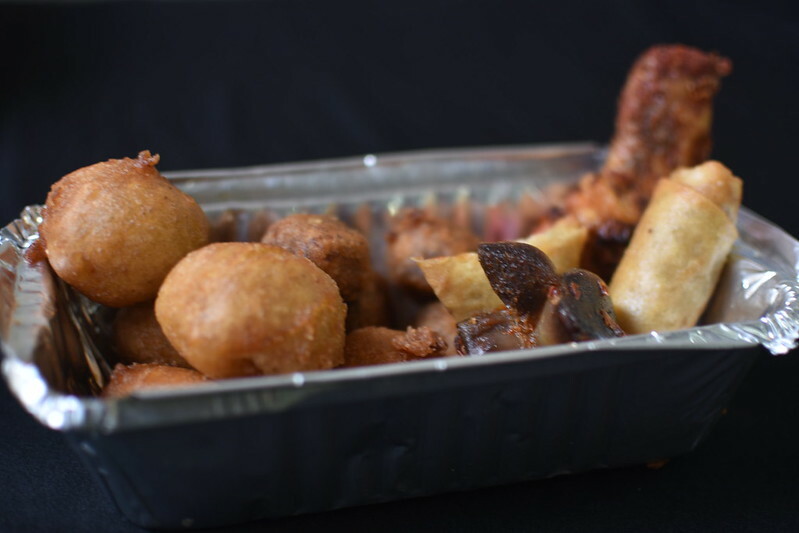 So yeah, small chops are an awesome way to celebrate every and any.